Coworking Space Calgary for those seeking the future of work. Calgary in Alberta province of Western Canada has got some cool coworking spaces. 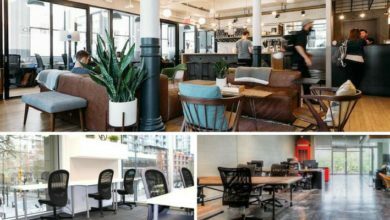 The concept of coworking seems to be going great with the people of Calgary and hence the city has seen a rise in the number of coworking spaces to meet the demand in recent past. With fully serviced offices, freelancers, startups and entrepreneurs are moving into coworking spaces to build a community and grow. Most of Calgary coworking spaces are full of activity and welcome newcomers on a daily basis. 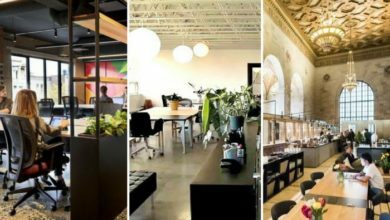 Let’s dig into what’s on offer at the best coworking spaces of Calgary. 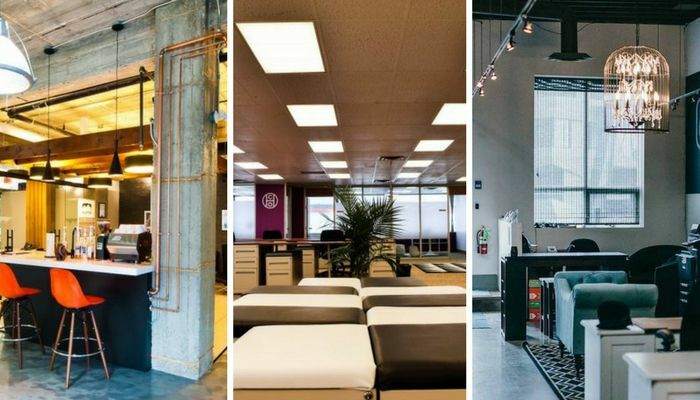 Browse through the coolest coworking spaces based out of Calgary. Read about the facilities being offered by each one of them along with their membership and pricing plans. Providing a comfortable and competent environment for better work efficiency of professionals, Assembly Coworking space Calgary is located amidst the chaos of the city for giving you some time off to ponder upon your projects. Calling themselves a little different than the usual coworking spaces of Calgary, Canada, they not only aim at providing you with a good working ambience but also provide amazing perks alongside to keep the morale of the individuals high. 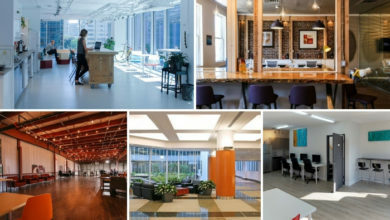 Facilities Available: Kitchen, Cafe, Rooftop patio, Modern desks, ergonomic chairs, janitorial services including cleaning, cloud computing services etc. Their rooftop patio and open spaces let you unwind while you sip on amazing beverages and assorted snacks offered by this shared office space in Calgary. To boost the bond of the community, group events are organised every now and then wherein all members belonging to tech start-ups and small businesses participate. 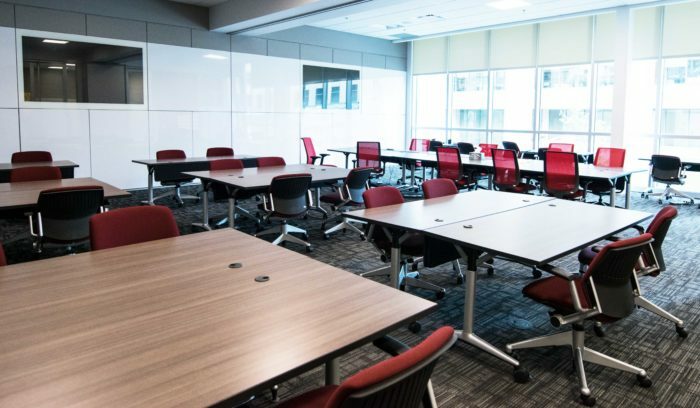 The USP of this coworking space in Calgary is that additional support in terms of IT, Legal Services, Financial Assistance is also provided in-house for the members for the upliftment of their businesses and project support and guidance via professionals. 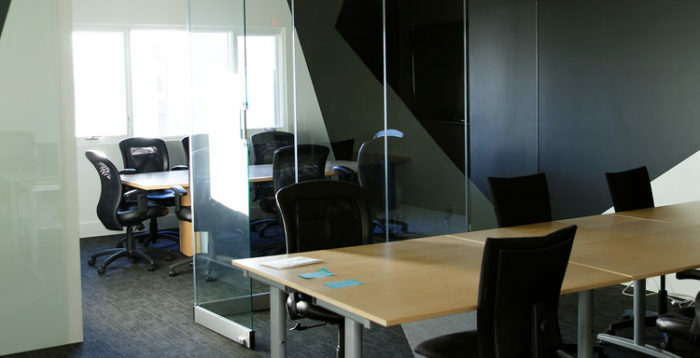 Pricing Plans: The pricing plans at this serviced office space in Calgary vary as per your needs. The price starts from just $300 per month for one desk up to 6 months and it increases to $400 per month for more than that tenure. With a minute addition into the cost, services like telephone extension, boardroom access, office storage space and heated parking facilities are also available for the members. Nothing defines coworking concept better than the Collective 12|12 in Calgary, Canada wherein all you need to bring is a mind full of dreams and a laptop in your bag. Rest all of it is taken care of by this amazing and most sought after coworking space in Calgary. The workspace is aimed at inspiring the next generation of entrepreneurs and skilled professionals to come together with their big ideas and dream to realise them together. Being a constant pillar of support to a huge chunk of innovative people who are ever evolving with changing times and constantly upgrading themselves, at The Collective 12|12 coworking Calgary you name it and they have it for you. 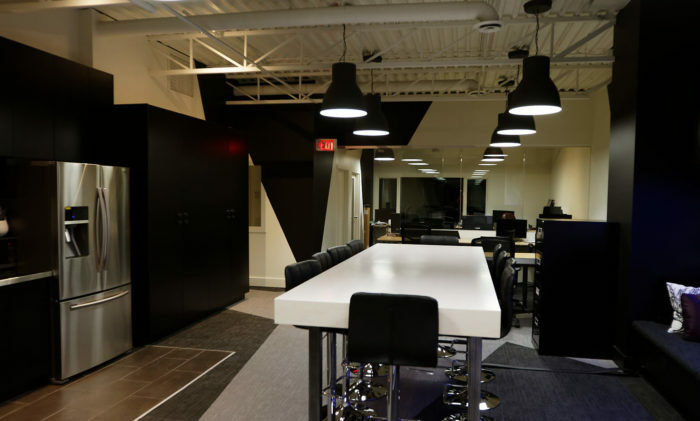 Facilities: The facilities and amenities made available to all the members of this amazing coworking and serviced office space in Calgary, Canada includes free access to kitchen cafe with caffeinated beverages like coffee and Red Bull. High-speed internet with business services like faxing, scanning, printing etc. and forwarding mail service. Price & Membership: The pricing plans at The Collective 1212 coworking space Calgary have been divided into four sub-categories as Part Time, Full Time, Daily Drop-In and Only Mailing Services. The Part-Time membership at this shared office space comes with kitchen cafe pass & 4 hours of boardroom access at $219 per month. A full-time fellow can do the same at $445 per month with unlimited access to the shared office space and boardrooms. A daily desk is available at $25 per day while mailbox service is available at $50 per month. Going by their name to bridge the gap between your dreams and aspirations with the realisation and execution part, at The Bridge Coworking Space in Calgary, Canada, you have easy access to avail all good facilities that would help you achieve your goals. With it’s easily accessible centrally located shared and serviced office space in Calgary, you can be here by bus and train routes. They ensure you the best working ambience amid the hustle and bustle of the city. Perks: The facilities offered at this beautifully done coworking space in Calgary range from free access to high-speed internet, private, semi-private meeting rooms, shower facilities in the gymnasium, business services like photocopier, printer, scanner etc, and of course coffee. For all those entrepreneurs who have a baby at home, daycare facilities for them simply add a feather to the cap. Floor to ceiling installed whiteboards ensures you track your progress on a stipulated time period basis. Membership Cost: Their membership offers include the most amazing ‘PARENTPRENEUR PLANS’ for ensuring that the baby on board remains a happy child while you work your sweat out via their daycare facility available at just $140 per month. This facility is also available on a daily basis. 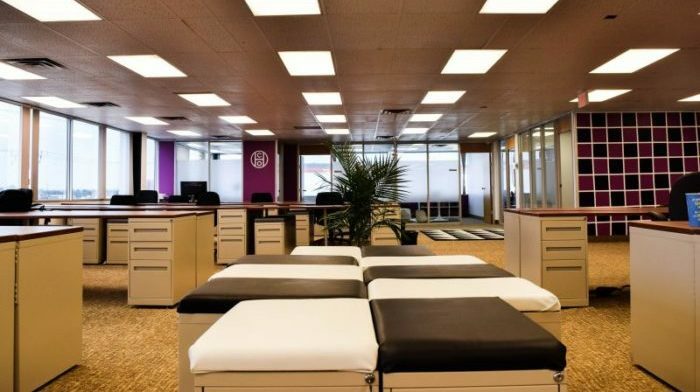 For virtual office the price is $50 per month, mailing service is priced at $65 a month while an open desk at The Bridge Coworking Space Calgary can be grabbed at $200 per month. The semi-private office space with logo on the desk and storage space is priced at $600 per month. 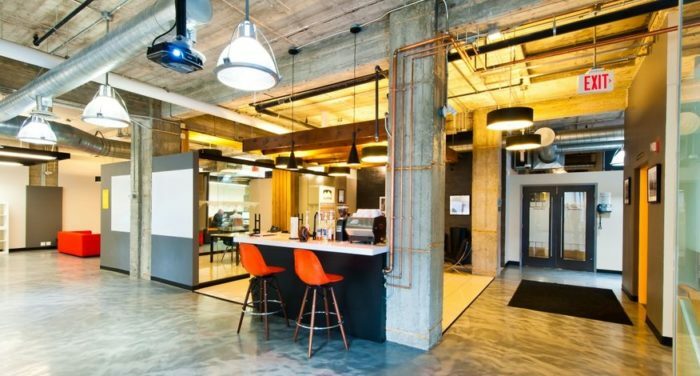 Driving forth with a social mission, HustleCo Coworking Workspace in Calgary provides a great ambience for hustlers and innovative entrepreneurs who are hungry to achieve more in life. 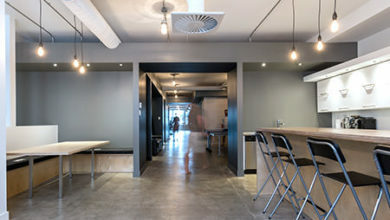 They provide inspired & great shared office space in Calgary for freelancers and anyone managing his/her own business. 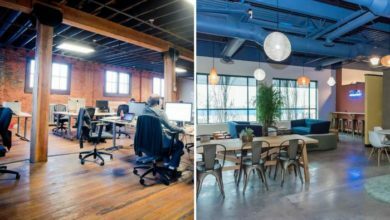 Facilities: HustleCo Workspace Calgary is one such coworking space that also builds and maintain websites, ensures SEO boosting, arranges regular sessions & workshops and also carry out promotions for your business. This all is apart from providing basic business development tools like internet facility, cafe culture, mailbox facility etc. Cost & Plans: They have monthly as well as drop-in plans available for consumers who want a coworking space in Calgary. For on-tho-go hustlers, a shared desk is available at $250 per month while a dedicated desk over here costs $400 per month. With their amazing weekly deals, a 2-weekly pass is available, 10-daily drop-in passes is priced at $150, 5 of them are priced at $100, daily pass at $25, night vendor one at $50 while for virtual office space it ranges from $75 to $150 per month. The Commons is Calgary’s common lifestyle place for local professionals providing them with great work ambience. 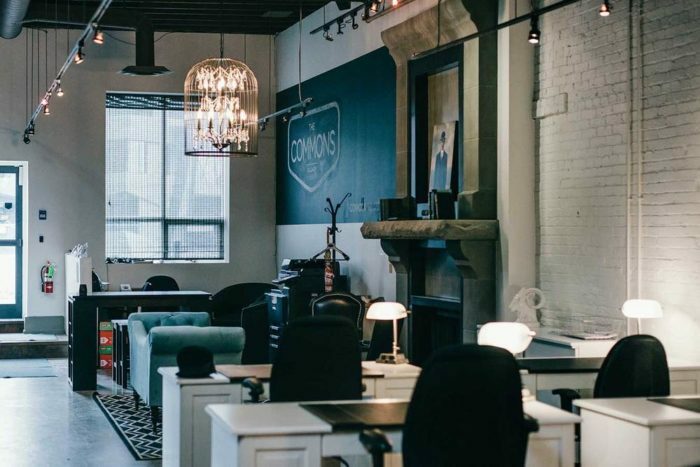 Catering to the needs of skilled individuals who wish to remain motivated whilst chasing their dreams with constant continuity, The Commons coworking space Calgary provides them with the business tools to enhance their productivity and polish their skills to achieve more and better in life. Facilities: The Commons shared workspace provides hot desks, private office spaces, exclusive meeting rooms, event venues and all of that with stylish modern outlook. Members can organise events and schedule meeting for when required. 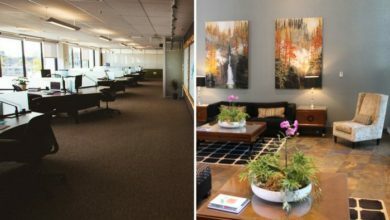 Price Details: Full-time dedicated desk at The Commons coworking Calgary start at $540 per month while private office spaces are available at $1300 per month. For those who are looking for part-time or non-dedicated desks can avail the service at $150 per month. They also have a commuter pass starting at $175 for 5, 10 or 20 days which is valid for 6 months duration. With a tag line of ‘Work for yourself, not be Yourself, Work Nicer coworking space Calgary is yet another awesome shared office option in the city. With an ambience that is themed red in colour, Work Nicer Calgary is a place that provides more than a desk. One great thing about Work nicer is that they place 10% of their profit back into the community to help it grow strong. Perks: Along with a high-speed internet, a cafe and printer and scanning services, they also have gym and showers within the workspace for coworkers. Pricing Pans: The membership cost at Work Nicer coworking space Calgary are divided into 4 plans namely floating desk, semi-private or private office, virtual office plan and daily drop-in. The cost of a private office over here starts from $700 while a part-time hot desk can be availed at $200 a month with 5 days access. More options for 10 days, 15 days and even 20 days a month access are available. Well designed and crafted interiors at this coworking shared office space in Calgary provides the young enthusiasts of the city opportunity to have their own professional space in the region. Situated at a walking distance from the downtown core, the business complex ensures good quality ambience. Facilities: Creating value for money by building projects having multiple utilities, the shared workspace and serviced offices provided by Paserium have world class facilities available for leading professionals and budding entrepreneurs of the region. Membership Details: One-person desk at this coworking space Calgary is available at $625. Space for two at $720, window seating for one person at $820 while two-person seating by window side is priced at $950 per month. Also, all these prices are subject to change, so contact their desk for further details of pricing plans at this coworking space in Calgary, Canada. The city of Calgary in Canada also has a Calgary Coworking Alliance which is a portal where you can find a coworking space near you. It can be found here – https://calgarycoworking.ca/. Many coworking spaces of Calgary are a member of this alliance.